1. Firstly, pick a design within the First Edition Travel Notes 6x6 Paper Pad and cut it down to 15cm x 11cm. Adhere this vertically, in the centre of your Dovecraft C6 card blank. 2. Cut an 8cm x 15cm strip of the camper van paper within the First Edition Travel Notes paper pad. Glue this to the centre of your card blank. 3. Find two coordinating sheets in your First Edition Travel Notes paper pad and cut two, 15cm x 4cm strips. 4. Pick one and punch four circles using the Fiskars Lever Punch Medium- circle. Start this by measuring down 0.5cm from the top of your vertical strip and punching out a circle. Continue measuring down 0.5cm and punching out a circle until you have four cut outs. 5. Add 3D foam pads to the back of your stamped out strip and stick it to your second Travel notes strip. Glue your finished strip vertically, in the centre of your card. 6. Pick a patterned sheet from the Travel notes paper pad and die cut the letters to create the word, ‘Best’ from the First Edition Alphabet die set. On the same paper design, die cut the word ‘DAD’ from the First Edition Male Sentiments dies. TIP You don’t have to use different die sets to create the sentiment, the choice is in your crafty hands! 7. Glue the word ‘best’ to your paper strip by gluing each letter in each stamped out circle. With 3D foam pads, stick the ‘DAD’ die cut to the bottom edge of your strip. This is a great way to create dimension on your cards and you could try this design with other paper craft collections. To create a different effect, you could cut out a tag shape and die cut the words ‘Best Dad’ and adhere your sentiment to the centre of the tag. The different paper designs within First Edition Travel Notes complement each other so well and look great on a Father's day card! 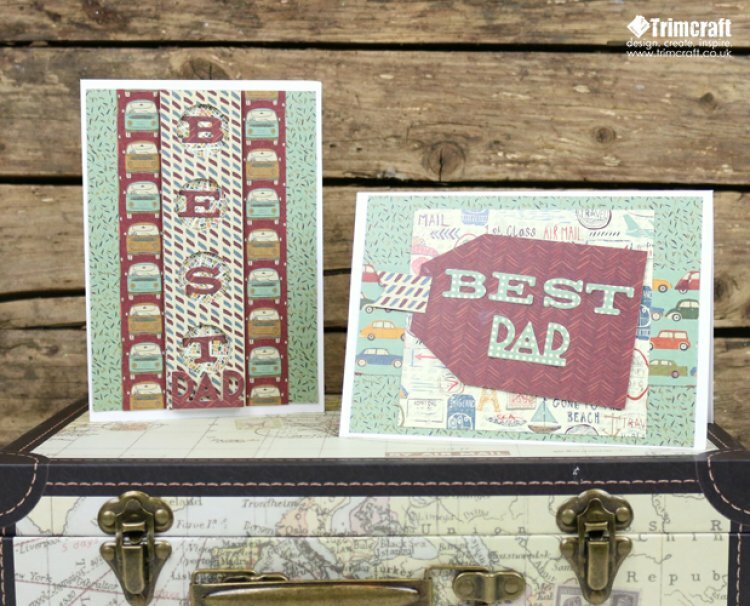 We’d love to see your Father’s day crafts so remember to upload your wonderful makes to the project gallery and when uploading to social media, to #Trimcraft. Have you read our scrapbook article? We’re sure you’ll find a few handy techniques that will give your scrapbook pages a burst of colour and excitement.